Following yesterday’s deadline for submitting applications to run for Undergraduate Association Senate, 10 students have been approved as candidates for the Senate elections. Currently, seven constituencies — Simmons Hall, Random Hall, Senior House, McCormick Hall, Living Group Council, Panhellenic Association, and Off-Campus — do not have candidates. Students will have until Monday’s late petition deadline to have their names added onto the ballot. Campaigning for Senate and 2010 Class Council elections officially begins at 8 a.m. this morning. Four of the 10 Senate candidates are incumbents. See page 13 for a list of the candidates. Electronic voting begins on Monday at 12:01 a.m. and ends Thursday at 11:59 p.m. Paper balloting will be in Lobby 10 on Friday, Sept. 29, according to the UA Web site. According to UA President Andrew T. Lukmann ’07, two e-mails were sent to the undergrads@mit.edu mailing list publicizing the elections, one about two weeks ago and one Wednesday night. This is part of an effort to increased publicity for UA elections. 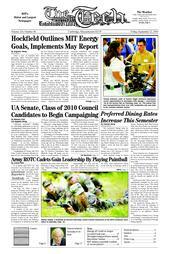 The extra publicity may be working, UA Election Commission Chair Michelle Jeong ’08 points out, because a record number of freshmen have submitted petitions for both class council and UA senate elections. But the effect on upperclassmen is less apparent, because they have again showed less interest in senate positions, UA Vice President Ruth Miller ’07 said. Last year at this time, five Senate constituencies were without candidates and 12 of the 14 candidates were upperclassmen. This year, seven of the 10 candidates are upperclassmen. One change to this year’s elections, Miller said, is the amount of time candidates will be allowed to determine their affiliation, either with their dormitory or Fraternity, Sorority, or Independent Living Groups. According to Miller, the first UA Senate meeting will be held on Oct. 2, earlier than in previous years, which is “a great improvement over previous years.” This gives the Senate time to approve budgets sooner, giving committees and student groups access to funds earlier, Miller added. In the past, a separate period of time was set aside for candidates to decide whether to affiliate themselves with their FSILG or their dormitory. There was also additional time set aside for campaigning before the vote. The delay postponed the first UA meeting to the middle or end of October, Miller said.